To put it mildly, I love taking pictures. Oodles and oodles of them. I would even venture to say it's an addiction. One that's gotten much worse since having kids. With the holiday season nipping at our heels, a few weeks ago I realized we didn't have a family photo with our newest addition, baby Ben. As you might imagine, I am one of those folks who has joined the Christmas card family photo craze. It's such an easy way to share a family update with friends and loved ones, though truth be told I miss the beauty and simplicity of classic Christmas card illustrations like the ones I grew up with. It was time to drag - oops, I mean corral - the family outside and snap away! 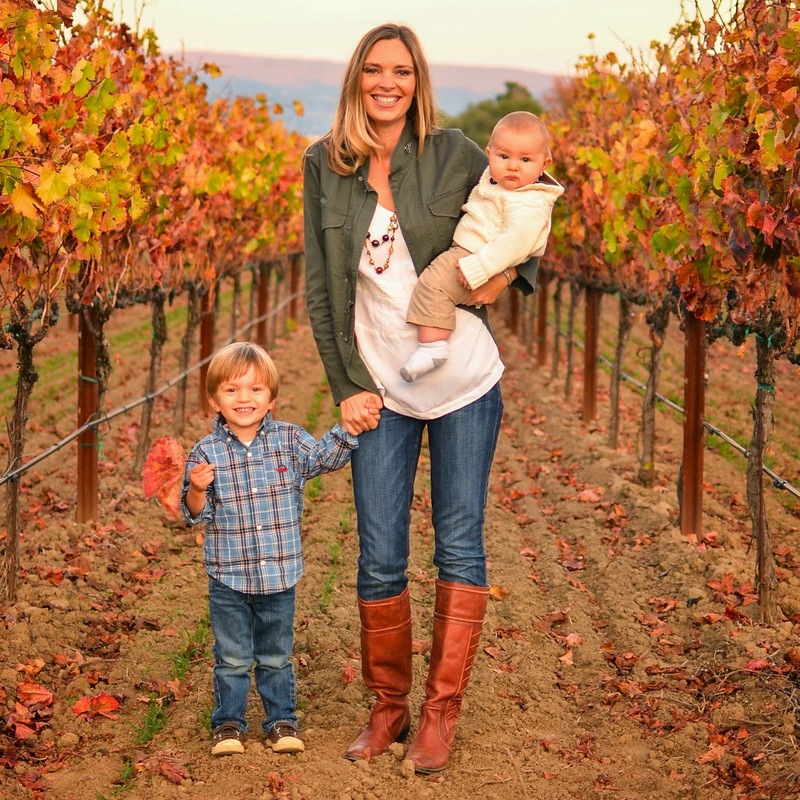 Since becoming a mom and the Official Family Photographer, I've learned a lot about how to take a family photo. From investing in the right tools to brainstorming ideas to being the family cheerleader, there is a lot that goes on behind the scenes to take a good picture. But despite the time and effort, the final result is always worth it. If you're frugal like me and prefer to take family pictures yourself - vs. hiring a professional photographer - I hope these tips will help you make your next family photo a great one. 2. White Balance: I've found no other camera feature impacts the quality of photos as much as white balance - except, perhaps, focus. White balance influences the color tone in your pictures, making things like skin tone look natural or sallow. Find the white balance setting on your camera and play around with it to figure out what settings you like the best. There is much you can learn from your camera's manual on how to get started. The time of day and the place you are taking photos - for instance inside vs. outside - will impact the white balance settings, so take your time learning this feature. When using white balance settings for your family pictures, always take a few practice shots to make sure the colors look good. If you're really up for perfecting the white balance in your photos, find out if your camera has a custom white balance feature. This enables you to set the white balance manually. Recently I invested in an Expodisc to help me do so with ease. The colors look great. Every. Single. Time. 3. 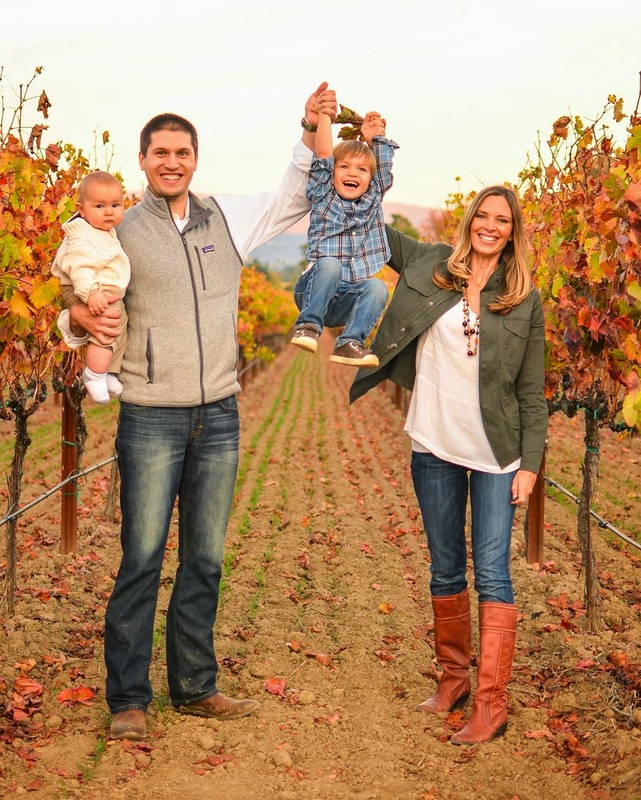 Get a tripod: If you want to take your own family photos, this is a must. I've also gone the whole stacking-books-on-a-chair-until-they-are high-enough-to-hold-the-camera route, but it's incredibly frustrating and you never know when you're camera is going to topple off. For around $30 you can get a great tri-pod that you'll use for years. 4. Visit Pinterest for inspiration: What did I ever do before Pinterest? Last year was the first that I visited the site for Christmas photo inspiration and I wasn't disappointed. Within five minutes I had five easy ideas for Christmas card pictures, including the theme you see below. What did we end up doing for this year's Christmas card? Well, you'll just have to wait and see! 5. Get your props ready: Props for the photo to the right? 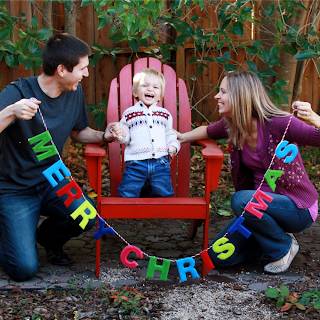 A "Merry Christmas" sign from Target and a red Adirondack chair from our backyard. Other props for a Christmas card might be Christmas ornaments, Christmas lights, garland, etc. Gather these together so you're ready to go when the time is right. You might even have a few different ones to try so you have plenty of photo options to choose from. 6. Convince reluctant spouses/kids: Does anyone's husband love to take family photos? Mine needs a little friendly reminder that at least we're not hiring a professional photographer for $400. Also, I've found that promising to keep your "photo shoot" to a reasonable time limit (like 20 minutes) helps. And taking pictures right after a yummy meal. 7. Dress the part: You don't need to be matchy matchy, but it helps to think about what everyone will be wearing before you snap away. This year I found a great blog post on family portrait wardrobes, which was just the inspiration I needed for the vineyard photo above. Decide if you want everyone to be casual (jeans) or dressy (slacks). Make sure to choose colors that everyone looks good in, which in the winter tend to be colors that brighten skin tone (not, say, light gray). My favorite tip? Start the process by mom choosing her outfit so that she feels and looks good. Then match the rest of the family to what she's wearing. 8. Location, location, location: In my option, unless you have professional lighting outdoor family photos almost always look better than those taken inside. Scout out a few locations by looking for places that don't have a lot of "noise" in the background. For example, the Christmas photo above was taken in our backyard against a backdrop of trees - not facing the (messy) back of our house. The same concept goes for the vineyard photo above. Straight vineyard rows make for a simple setting that does not detract from the subjects. Don't have a good spot in your backyard? Check out your neighborhood park. 10. Choose your timing wisely: Especially if you're taking pictures outdoors, this matters a bundle. I've learned over time that I get the best outdoor photos in the morning or late afternoon/sunset, or when it's cloudy outside. What you want to avoid is the sun beating down overhead and causing people to squint - or casting a lot of shadows. 11. Set up your gear before the family joins you: The time to keep the family focused on taking photos is limited. As much as possible, make sure everything is ready to go before rousing the troops. 12. Take test shots and focus your camera: Before going full throttle, take a few test shots and make sure the photo is framed as you would like it, that everyone can be seen in the photo, and that your camera is focused on the subjects. I can't tell you how many times I've gone through pictures to find the camera is focused on the trees rather than the people. Don't let this happen to you. 13. Put your camera on self-timer or buy a remote: Every point-and-shoot camera out there, and all DSLRs, have a self-timer function. If your camera has the capability, set it to take 5+ consecutive photos each time the timer goes off. You can also invest in a wireless remote if your camera is compatible. 14. Don't be too serious: OK, now is the time to have fun! Get in front of the camera, have everyone smile and start shooting. Take some photos where everyone is smiling and looking at the camera, and a few where everyone is looking at each other or, say, a baby. Laugh, squeeze each other, lean in, etc. My husband has even been known to lovingly pinch my bum to make me smile. 15. Different scenes: Take some photos where everyone can be seen head to toe, some from the waist up, and some sitting (or in another pose). Mix it up a bit because you'll find at the end that certain scenes really click and others don't. 16. Snap away: After five minutes you may think you've taken enough pictures. What I've found is that - especially when multiple people (and kids!) are involved - you get one good shot for about every 50 you take. Our family photo shoots typically result in a few hundred photos, of which ten might be decent (everyone looking at the camera, no funny faces, double chins, eyes closed, etc.). Of those ten, one or two is a winner. While even a hundred photos might sound like a lot, if they're taken at rapid-fire your photo shoot shouldn't take more than 15-30 minutes. 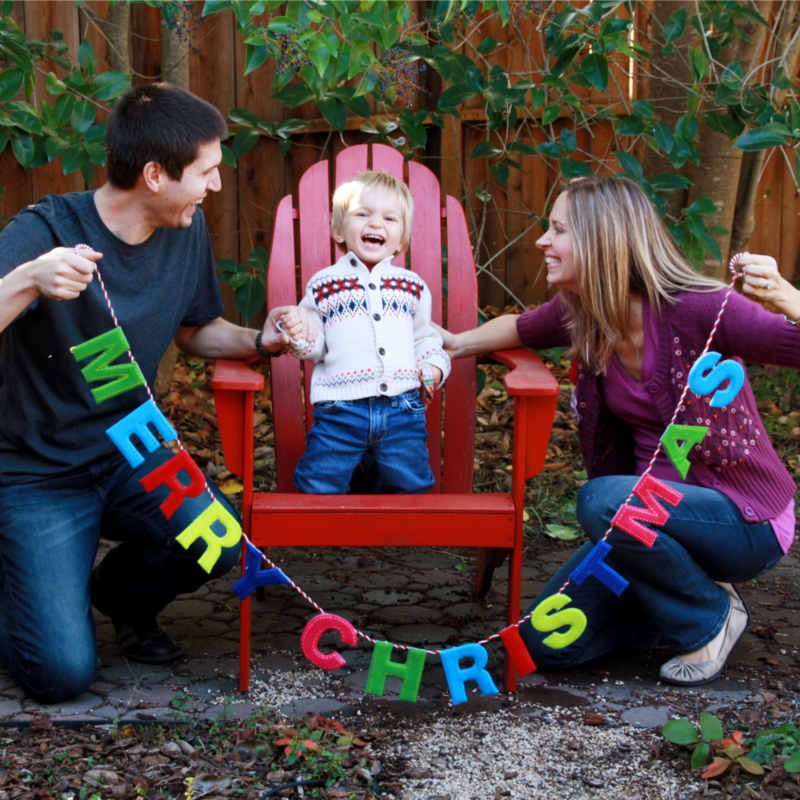 Best of luck with your next DIY family photo session! Have your own tip for taking great pictures? Please share in the comments.